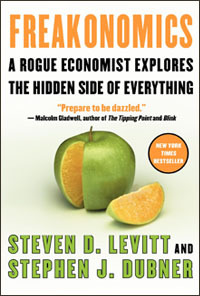 I recently finished reading Freakonomics: A Rogue Economist Explores the Hidden Side of Everything, the freakishly popular book about applying the tools of economics to social phenomena. It was a fair read for dipping into occasionally. I found the reverential tone the authors used when talking about each other grating, and the chapter on baby names was too clogged with tables of numbers, but overall the economics were interesting. My big gripe: I think the authors should have tried harder to be objective scientists, and resisted the impulse to push their world view so hard. A constant theme of the book is that incentives are powerful, subtle, and sometimes counter-intuitive. They can backfire, and they can be unintentional, and they can be difficult to see clearly, even when they are working forcefully. I agree with the authors that this is true, but they’ve got a bad case of having only a hammer, and seeing everything as a nail. What larger truths do these lynching figures suggest? What does it mean that lynchings were relatively rare and that they fell precipitously over time even in the face of a boom in Klan membership? The most compelling explanation is that all those early lynchings worked. White racists—whether or not they belonged to the Ku Klux Klan—had through their actions and their rhetoric developed a strong incentive scheme that was terribly clear and terrlibly frightening. If a black person violated the accepted code of behavior, whether by talking back to a trolley driver or daring to try to vote, he knew he might well be punished, perhaps by death. So by the mid-1940’s, when Stetson Kennedy joined up, the Klan didn’t really need to use as much violence. Many blacks, having long been told to behave like second-class citizens—or else—simply obliged. One or two lynchings went a long way toward inducing docility among even a large group of people, for people respond strongly to strong incentives. And there are few incentives more powerful than the fear of random violence—which, in essence, is why terrorism is so effective. Lynchings worked!? Forget the PC aspect of this (you’ll have to do that a lot over the course of the book). It doesn’t even hold water as a hard-headed objective interpretation of the facts. They completely overlook the shift in attitudes over the course of 100 years, which is probably a much larger reason for the decline of lynchings. Blacks in 1960 were acting a lot less conformant than those in the 1890, so there’s no correlation between “accepted behavior” and lynchings in the first place. It’s interesting that they say “the most compelling explanation”. Shouldn’t they be looking for the best-supported explanation? To an economist, especially one trying to prove that incentives are everywhere, “lynchings worked” must be very compelling. But we’re supposed to be scientists here. It is hard to move beyond correlation to causation in observing the social world. That’s the reason scientific techniques are difficult to apply there. But the authors are claiming to have done it. They should try harder. In fact, the book’s claim to fame are these sorts of controversial claims. Others are better supported, but many provide just as much opportunity for criticsim, leaving me wondering how much discussion is happening out there about the connections the authors make. By the way: the authors have a blog. Their critique basically comes down to the fact that the authors (in this case on their blog) believe the market is more powerful than physics. I was a bit disappointed with the book myself. On the upside its easy to read and offers some challenging ideas, but on the other side, its too quick and doesn't seem that thourough. The chapter transition magazine quotes about Levitt being such a genius were rather annoying too. I think it may be that all of the noise on the page (navigation links, sidebar, blogroll, etc) outweighs the page content. The noise is all about blogging. While I haven't read the book or the studies, I looked at the two links posted above, and in both cases many of the arguments are simply emotional appeals. One article titled "Australian columnist makes explicit the anti-black eugenic basis of Levitt's theory" basically is saying if you believe the data presented you are a racist. It also goes on to say that abortions actually caused the crack epidemic, but offers no data, only conjecture. It allows you to mark the section of the page that has the real content, using special HTML comments. But I haven't seen that much effect so far. I didn't know about AdSense section targeting. As an experiment, I changed my blog template to use them. I'm not absolutely certain that they help but I think I'm seeing more targetted ads on some pages. Thanks for the tip. OK, I've added the Google hint comments to my pages. Let the riches roll in! I have heard about this book recently in different online places- but only those based out of the US. I was very interested in the part about sumo bouts being fixed and how that was conveyed through consistent number patterns, but I don't think the Japanese media will touch it. I wonder if the book will be banned in Japan. "Blacks in 1960 were acting a lot less conformant than those in the 1890"
This kind of flat assertion could hardly dismiss an argument as unscientific. How would you conclusively quantify or prove it ? Assuming it can in fact be proven, it would not be sufficient to disprove the gist of the original argument, unless you were to fall in the 'all other things being equal' trap. Because 1960s whites were also probably much more tolerant than their 1890s forebears. So however disturbing it may seem, Levitt's and Dubner's argument could still be correct; decades of public lynchings and other oppressive acts could have contributed to make black social attitudes evolve at a different pace than whites', preserving and widening a gap that made blacks relatively more 'compliant' over time, from the whites' standpoint; a general argument that is in fact sustained in many other areas (health, education etc) to support affirmative action. Whether lynching was a significant factor in maintaining or widening this relative gap is still another story. It does sound overly superficial, fwiw. But you can't dismiss an argument as unscientific with a simple assertion that is even harder to back up and, in any case, insufficient to make the case. Re "Blacks in 1960 were acting a lot less conformant than those in the 1890"
Well in the 2 decades prior to 1890, there were two black senators from Mississippi. By 1940, 3% of the blacks in the South were registered. By 1960, it was only up to 7% in MS. So the Freakanomics assertions may be wrong, but they seem defendable at least. e.g. 3-7% registration seems arguablely to be conforming to not participating in politics. Now whether that was due to poll taxes, literacy tests, threats of violence, etc. is debatable.